MRX Designs has a lot of great Cthulhu related projects with photographs and descriptions. Some of the stuff is a lot of fun, like a giant inflatable Cthulhu head. Anyone doing Angels in America might be interested in this tutorial on articulated angel wings. Thanks to Lost in Schlock for finding this. Saw this in Make Magazine: Daniel Deutsch built a full-size drivable Landspeeder from Star Wars. The site has great process shots and descriptions of how he did, along with some of the other great projects he’s constructed for various theme parks and companies. Blind Squirrel Props is a replica prop maker with a great blog in the same vein as Volpin Props. In fact the two have collaborated on some projects. There is a great tutorial on an Outlaw Star Caster Gun which Blind Squirrel designed and built, and Volpin made molds of. Check out Kronos Props as well, another replica prop maker. I love the precision and attention to detail these guys pull off. RAC Props is a website and online magazine run by Richard A. Coyle. Mr. Coyle has made props for Star Trek II, IV, V and VI, as well as Star Trek: The Next Generation. It’s an interesting mix of original prop making and fan replica prop making. As I’ve mentioned a few websites dealing with film props, I thought I’d point out some communities based around replicating famous props from films. These are great resources for a lot of tutorials, such as vacuforming, casting, and working with fiberglas. They also focus on DIY and inexpensive solutions, so any prop shop can benefit from diving through the wealth of material they have. The Replica Prop Forum – This is one of the cornerstones of the community, with members interested in props for a wide range of films. It also has discussions about costumes and scale modeling. Since it is a forum, it can take some time to navigate and search around, but it’s worth it. TK560 – This site has tutorials and guides to building a number of props from Star Wars, Star Trek, and a number of other sci-fi films. TK409 – Another site with tutorials for making do-it-yourself Star Wars props. The previous two sites are part of the 501st legion, the “world’s definitive Imperial costuming organization.” It is an organization of over six thousand people who dress like members of the Empire in Star Wars. All of these sites have a plethora of links to other DIY prop and costuming resources throughout the internet. The Magnoli Collection of Prop Replicas – Indy Magnoli’s collection of prop replicas. Most are based around the Indiana Jones’ movies, but some other films are represented as well. There are a good amount of paper props as well, with descriptions of how they were made. That’s it for now. Let me know if there are any other sites you find interesting. You can also point out any other communities or groups which would have useful information for prop people. John sent me a link to his Props on Paper site. 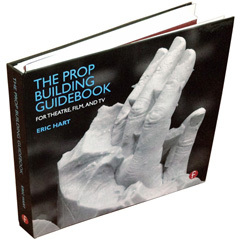 John is the head of props at the Grand Theatre in London, Ontario. He has a large number of paper props he has produced from over a dozen shows. There are a number of other sites which have collections of downloadable paper props. You don’t necessarily need to search for theatre props; there are large communities of replica prop makers and role-playing game prop makers with all manner of documents available online. The H.P. Lovecraft Historical Society has a number of replica paper props from the early twentieth century, such as telegrams, drivers licenses, and library cards. They also have a nice section on making paper props. P.I. Vintage has a lot of photographs from their Spy and Private-Eye Museum. Some are too small to be useful, but clicking through will find you many gems. The Propnomicon blog has a number of posts on paper props. A great source for researching vintage ephemera is eBay. Though it can be hit or miss, it’s one of the few sites where hundreds of people are uploading photographs of actual historic relics. You can search for your specific prop need, or search for “vintage ephemera“, or browse the Collectibles category. You can also find a large number of actual historical documents online, which you can adapt for your use. For example, say you’re dressing a New York City apartment building, and want some realistic documents hanging in the lobby.